That needs a little updating. Here are 5 things you MUST do. And 2 things you should. By now you may know me. Or maybe you don't. But if you do... you're pretty aware I like to make over things. Take something mediocre and make it (close to) miraculous. This was a rental property which had been used, and somewhat abused, for years. It really hadn't been touched much since it was built in the early 90's. This is what the kitchen looked like. Pretty bad. But I knew I could take this place and turn it into something a little more special! 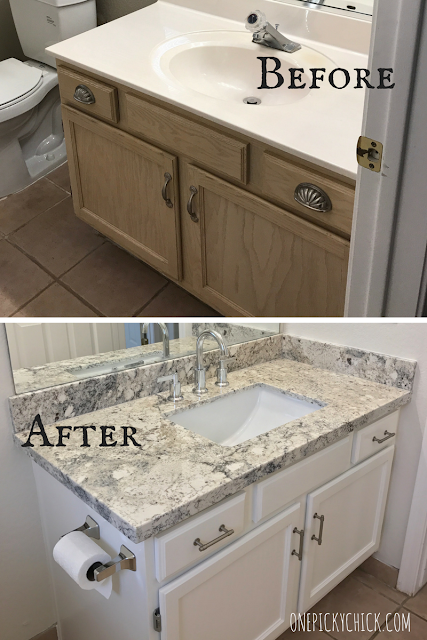 In many cases these days, if a house is in desperate need of new counters it's because there's an old Corian, laminate or in bathrooms, often times there is "cultured marble." That, by the way, cracks me up... it's such a nice sounding name for TOTAL CRAP! These days people are doing a lot of quartz (a man made product) and marble. There's some concrete. 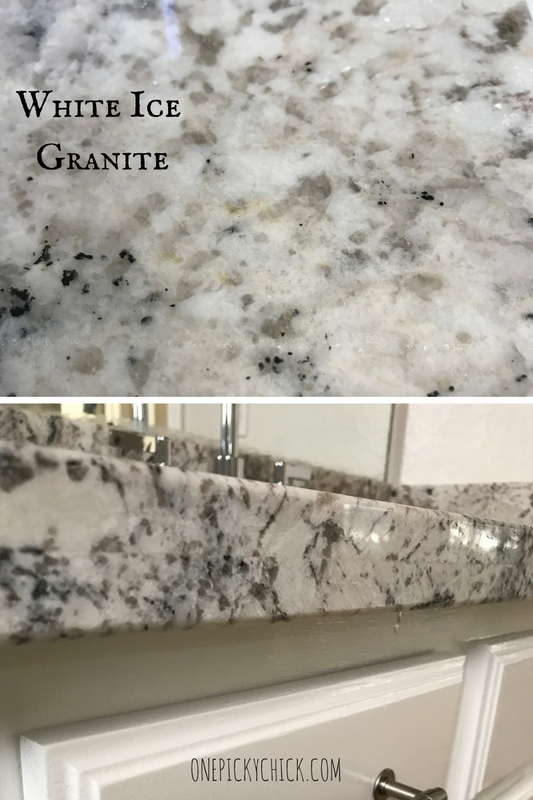 They're also still doing some granite, especially quartzite which is a more exclusive/expensive type of granite. 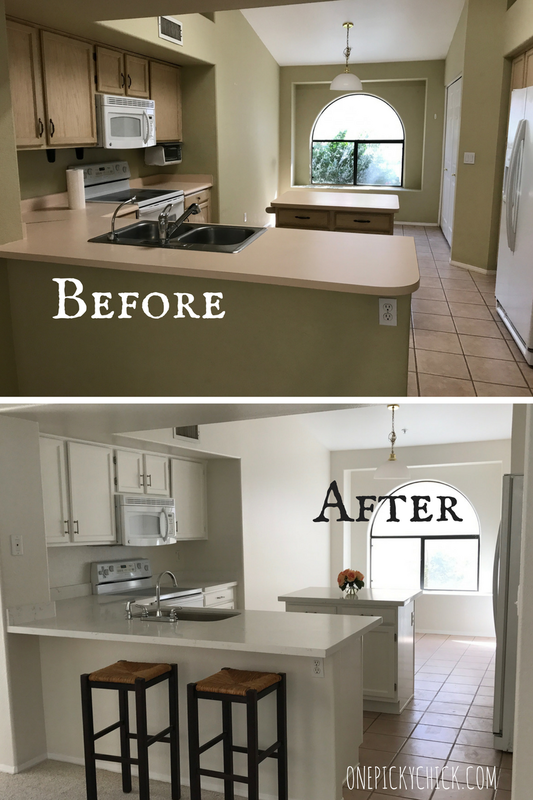 For the kitchen in this house I wanted to do a pretty Marble-looking white space. But I did not want the upkeep of marble so I decided Quartz was my best option. I like how clean it came out. As for the edges, I'm always about classic so straight edge works best. 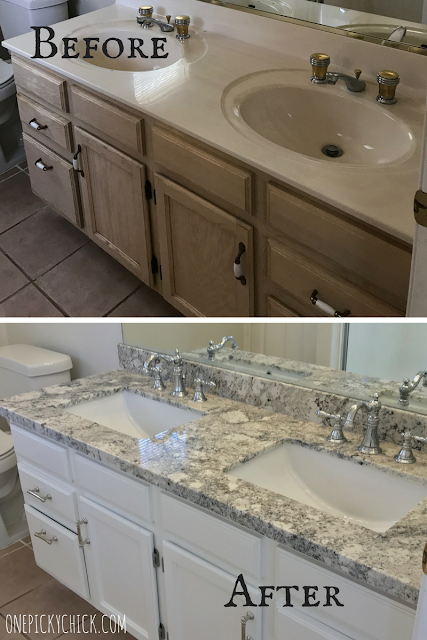 In the bathrooms, there are two, I decided to keep them consistent and do a White Ice Granite on both. Granite has been on the way "out" for a few years but I'm not sure it will ever be totally gone. At the time I needed it, it was the best option for my project. When you get those new countertops in, you most certainly, will have to put in new sinks. Everyone is doing rectangle vs. oval now. Also, it's all under-mounted sinks. I like a bright white ceramic. I know big surprise. Just can't go wrong. For the kitchen... stainless is still not a bad option. I also like the big huge tubs versus the partitioned ones. That is a matter of preference but it also seems to be more "in" right now. Then, the faucets continue to set the tone for your area. For instance, I wanted to go a little more "mainstream/classic" in one bath but for the master, I wanted it a little more special. Hence, different faucet choices. For the kitchen faucet, I wanted a simple goose neck. That's what I got. 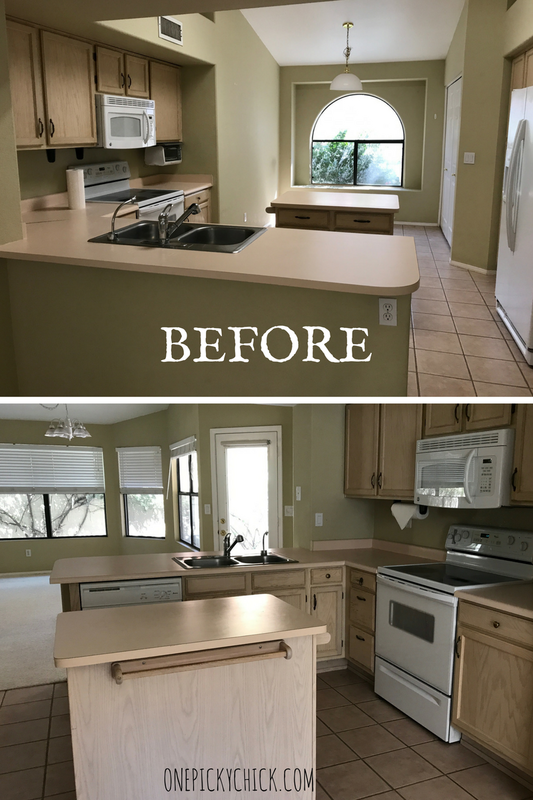 Once you get new counters in... you almost positively will want to do your cabinets. And the fastest, most economical way to do that is paint them. Period. It just is... they can completely transform your house. See for yourself. This is a no brainer. 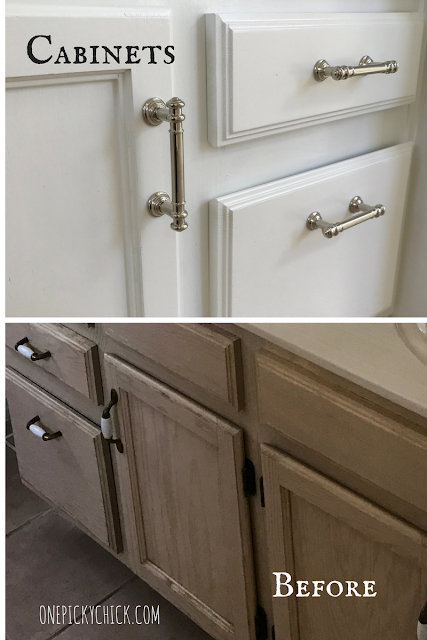 Once you get those cabinets painted just add new hardware. This is usually not that expensive to do. Especially if you keep the pulls on the smaller side. 3 inches will cost less than getting a 5-6 inch pull. Even though the larger sizes are really what people are doing today. 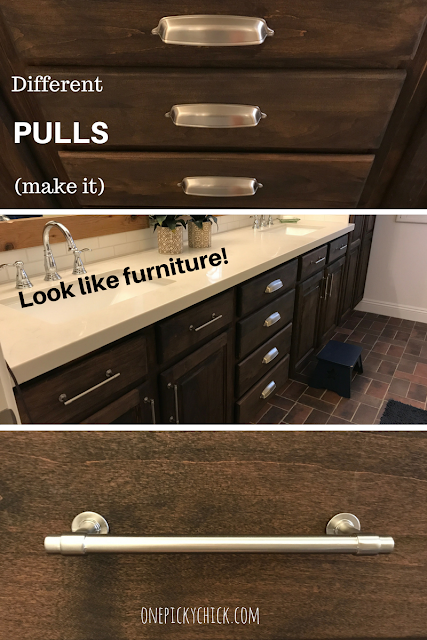 I also like changing up the pulls per space, like I did here in the Master Bath (pictures above in the cabinet picture) but that's not necessary if you want to keep it simple. Painting is always quick and easy. It can dramatically change the look of your house. This especially needs to be done if you have 10 different colors and 3 different accent walls in your house right now. First of all, and I can't say this enough. Choose neutral colors. The days of purple, deep reds and hunter greens are over. Those left when "Trading Spaces" was cancelled. Remember that show? I could not get over all those crazy paint colors. If you stick with a gray, caramel or dare I say white... you will never regret it. You may regret painting your dining room a bright orange. Commit to colors with decor or maybe some furniture. That way you can change things up when you feel like it. Now, with that said, I will say crazy color can be super great in some cases. I even saw a room painted black recently which was really intriguing. But those cases are rare. So tread lightly. 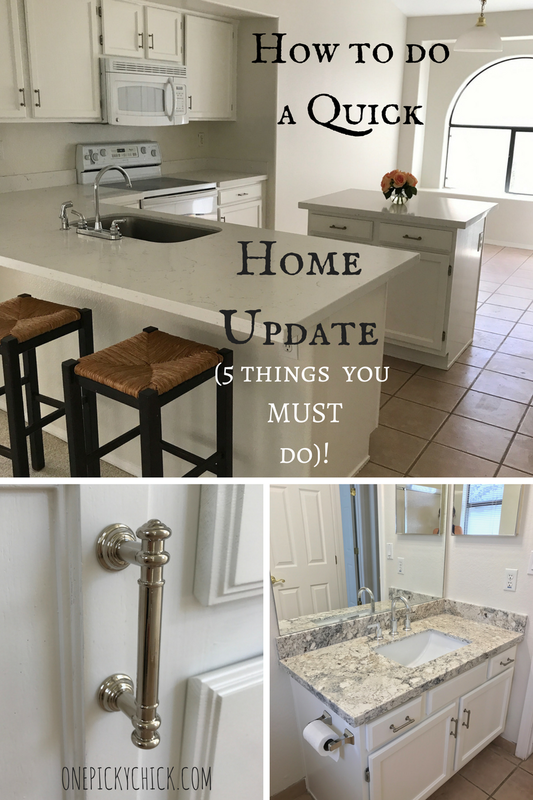 After those 5 things... you almost have a full remodel. But not quite. The next 2 things seal the deal entirely. I did not do the following 2 in the home above. This will make your remodel. Choose the right stuff and bam - you're in business. Wood is super hot right now. Yet it's classic and will never go out of style. It's not possible. Concrete is always cool. 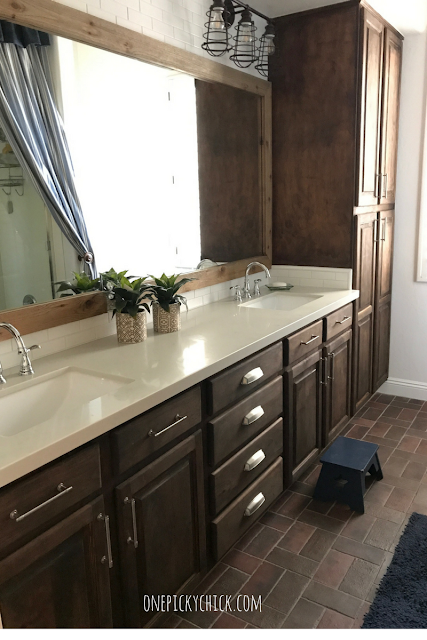 Tile is another great option. So many amazing choices. Here's my friends house. 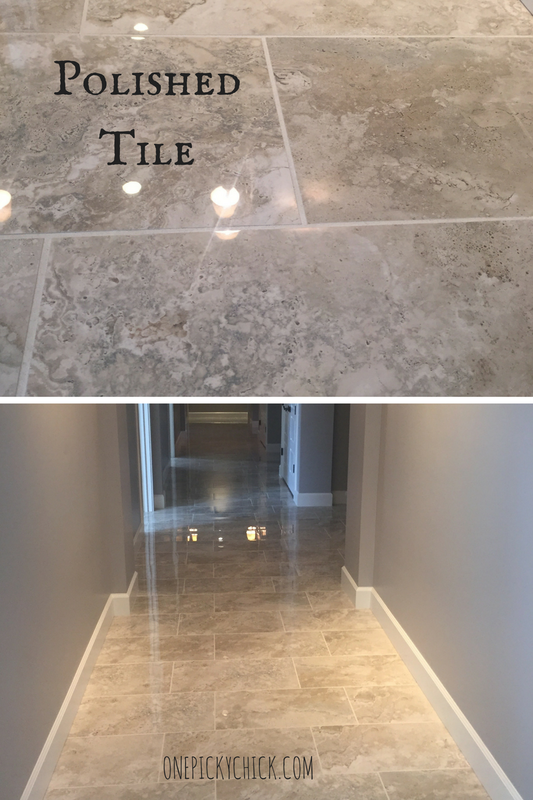 She chose to go with a polished tile. It ups the fancy factor a bit and looks almost like marble. But it's not. ** Program note - if putting in new floors, don't do carpet. For 3 reasons: 1, it's hard to clean. You can never really get all the "germs" out. 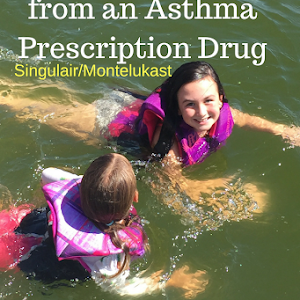 2, your allergies will go away instantly. No joke. 3, carpet chops up a room. One floor throughout a house or continuous in large spaces makes the house look bigger. I know, some people like the comfort of carpet between their toes in their bedroom. But all in all, it's not worth it. This is the jewelry after the dress. It's the icing on the cake. The cherry on the sundae. 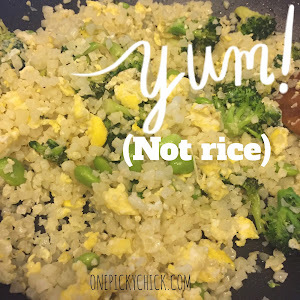 I did a blog about it HERE. New light fixtures will take your remodel from fabulous to gorgeous. Promise. A boy deserves a good bathroom. And so does his mom! Think long term, classic (do what you like, not what Pinterest tells you). Always. What or whom will the space be used for? Then consider that when planning/buying. How can it be done in the most cost effective manner? Below was we started with. No bueno. See? 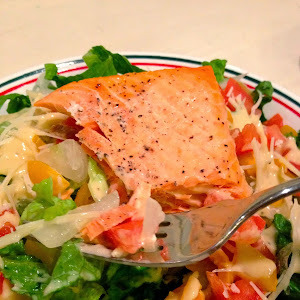 If you look around a bit on this blog you'll see some serious white in my house. I know white is HOT right now but I love it for different reasons. I wrote a blog about it HERE but one of the main reasons I use it so much is because it's just doesn't go out of style. It can certainly be not "on-trend" but white is forever. Ahhhhhhhh that's why BRIDES use it! 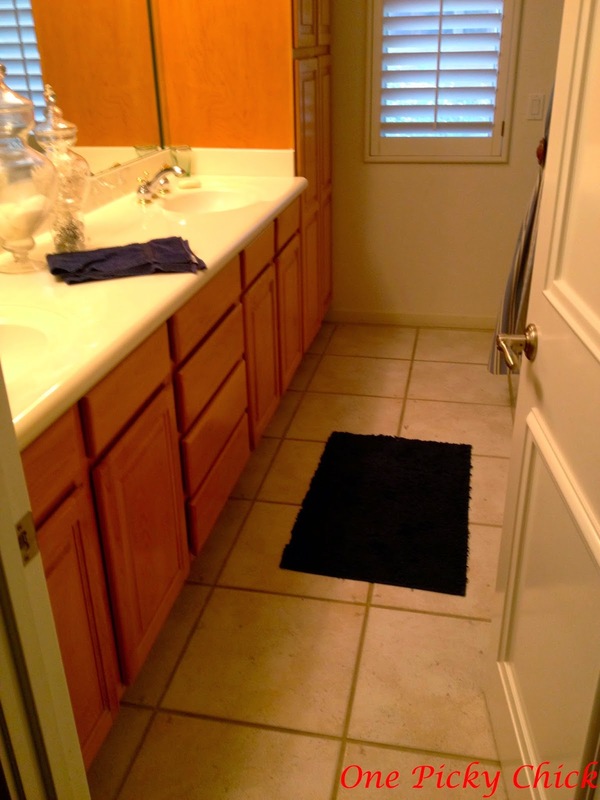 However, with all of that said, unlike in all my other bathrooms, I did not want to use white in this room. 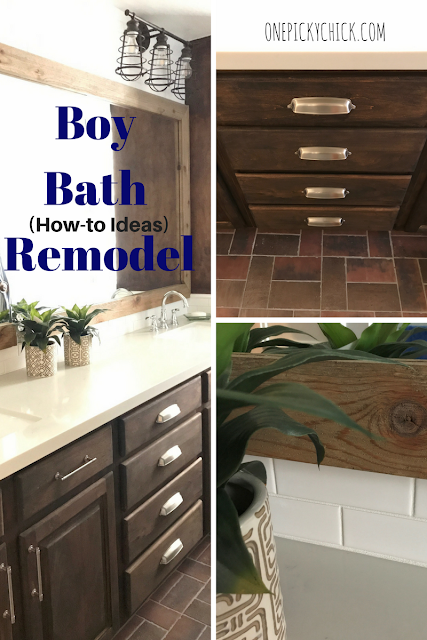 For a Boy Bath I took the stained cabinet approach. My husband sanded furiously and stained for days. It does take a lot of sweat and tears if you do it yourself - the right way. There are kits out there where you don't have to sand but BP (the husband) is perhaps pickier than I am, in some cases, and wanted to do it this way. 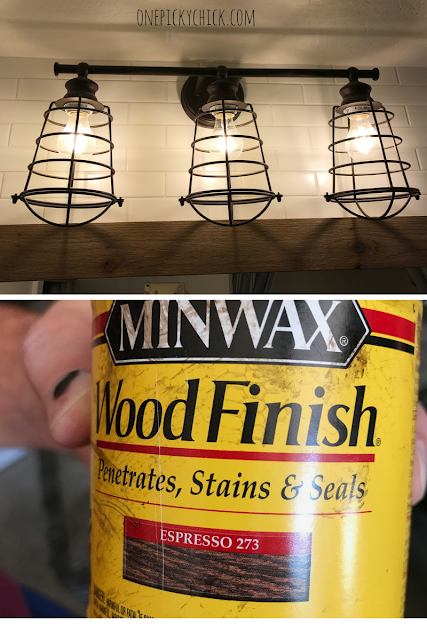 With the dark cabinets, and dark brick floor (which was put in a couple years ago - knowing the long term plan in my head) I knew I needed to lighten it up a bit so I wanted a light countertop to balance the dark. I also knew I wanted an overall rustic/rugged look. I used this stain from Home Depot. The color is espresso. It's a dark color. It's dark here but can go darker depending on the application process. I also picked out the industrial lights pretty early. I happen to love the industrial look. I'm hoping it's not a fad because I'm kind of using it a lot. 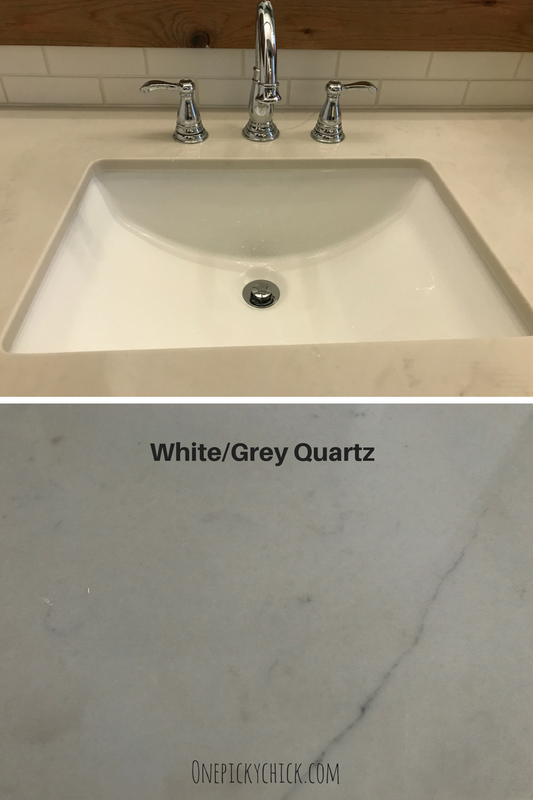 I got square, white, ceramic sinks to go with the white/grey Carrera looking Quartz. It clearly looks so different in different light. 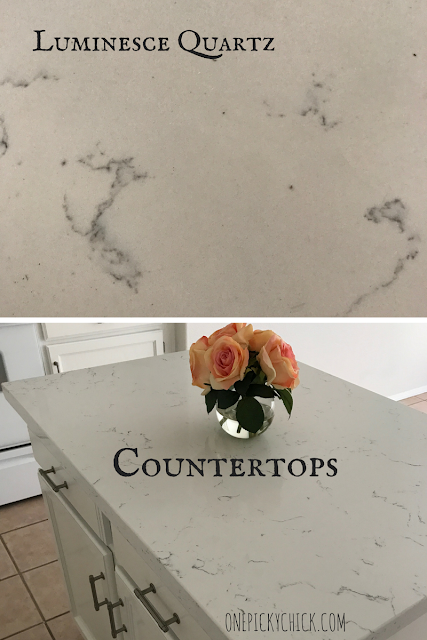 These are pictures of the same counter. Sidenote, for those not familiar, Quartz is a man made material which people have been using for a while now since it's pretty durable and consistent. There are MANY brands of Quartz out there. Some really expensive... some more well priced. As you can see above... I use CHROME FAUCETS. Here's why: they're classic. I know I sound like a broken record. But they just won't go out of style. Oil rubbed bronze was all the rage and today it's passe'. Now everyone is using the Antique Brass for hardware. It is gorge. It could stay current for a while. Heck, anything with the word Antique in it will stick around I suppose. But I believe it will never be as classic as chrome. So, the faucets I picked were a small goose neck chrome. 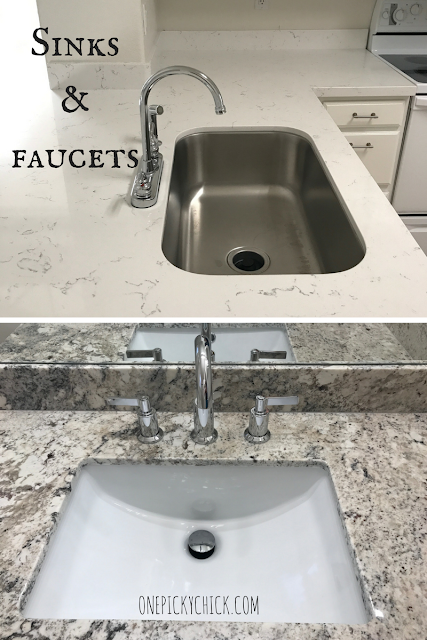 One more thought on faucets. Pick wide spread. They are a much more "upgraded" look and don't typically cost a lot. Next, I went with a small Subway tile back splash. Which (skips the mirror but) extends all the way to the ceiling. You can never go wrong with Subway tile people. I also did it because of the shower/bath which is across from the vanity. I have not re-done that yet. But if and when I do... it will be done in a subway tile which ties everything together! Next up... fishing touches like the cabinet "jewelry". That's what I call drawer pulls/handles/knobs. I got Francisco pulls for most of the cabinets but in the middle I used the Cup pulls. I thought the difference made it look more like furniture. And yes, you CAN MIX METALS! I get that question all the time. Mix... for the most part. But it may also depend on the entire design of the room so do so carefully. I often times go with a Satin Nickel drawer pull and a chrome faucet. Like in this case. Step 3 - Get to Work. After you've designed and shopped you need to put it altogether and get crap done! There are a few way to accomplish this. A) If you're super handy you can do this all by yourself. But you need skills, time and patience. B) The other option is to be you own general. That means you find your materials and workers, then organize it. Don't worry there's still 2 more options. C) You can also get a designer from a top notch, fancy firm. They're out there. But it will cost ya... plenty. D) The final option is to hire a local blogger/designer where you live to help you pick out, organize, schedule and find your trade people. Someone like me. But who lives by you. There are plenty of talented, smart, go get it done people where you live who can help you, you just have to find them. 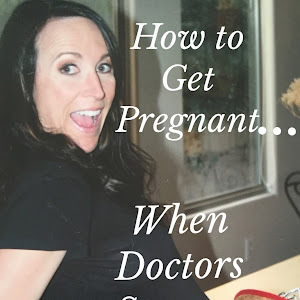 When you do... they can help you with just Step number 3... or start you back on Step number 1. Depending upon your needs. We were basically done with the bathroom but I needed to frame the mirror. I wanted something super simple to make it feel kind of hardy. I went to a reclaimed wood place to see what they had. They had great stuff... just a little too rustic for what I wanted. So we did it on our own. 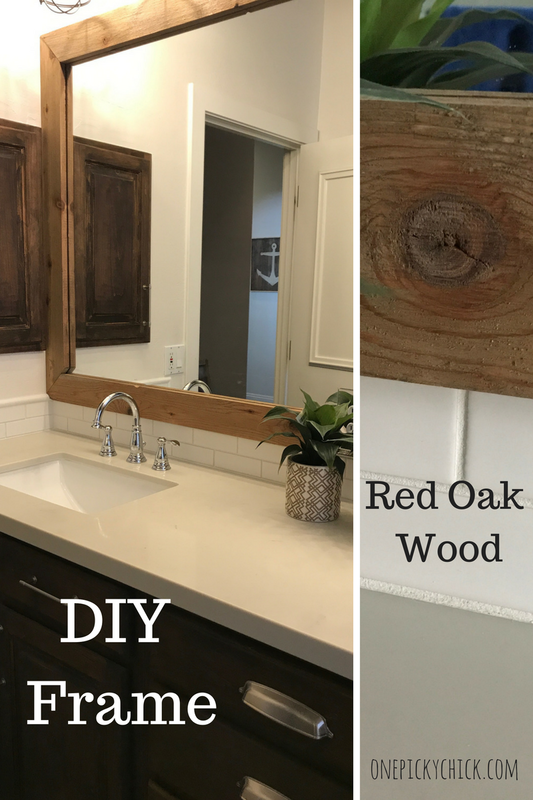 We went to Home Depot again and grabbed some (not warped) Red Oak. Turns out they had wood with some character which is what I wanted. Then we stained it with the same brand as above but got a much lighter color... I didn't want it to be too matchy with the cabinets. We pulled out the saw, grabbed some wood glue and bada-bing, bada bang. Done. I absolutely love it. I hope you do too!